October 11, 2017 – There’s no map showing all the billions of exoplanets hiding in our galaxy — they’re so distant and faint compared to their stars, it’s hard to find them. Now, astronomers hunting for new worlds have established a possible signpost for giant exoplanets. Astronomers found the likelihood of finding long-period giant planets is nine times greater for stars with debris disks than stars without disks. Caltech graduate student Marta Bryan performed the statistical analysis that determined this result. Researchers combined data from 130 single-star systems with debris disks detected by NASA’s Spitzer Space Telescope, and compared them with 277 stars that do not appear to host disks. The two star groups were between a few million and 1 billion years old. Of the 130 stars, 100 were previously scanned for exoplanets. As part of this study, researchers followed up on the other 30 using the W. M. Keck Observatory in Hawaii and the European Southern Observatory’s Very Large Telescope in Chile. They did not detect any new planets in those 30 systems, but the additional data helped characterize the abundance of planets in systems with disks. The research does not directly resolve why the giant exoplanets would cause debris disks to form. Study authors suggest the massive gravity of giant planets causes small bodies called planetesimals to collide violently, rather than form proper planets, and remain in orbit as part of a disk. 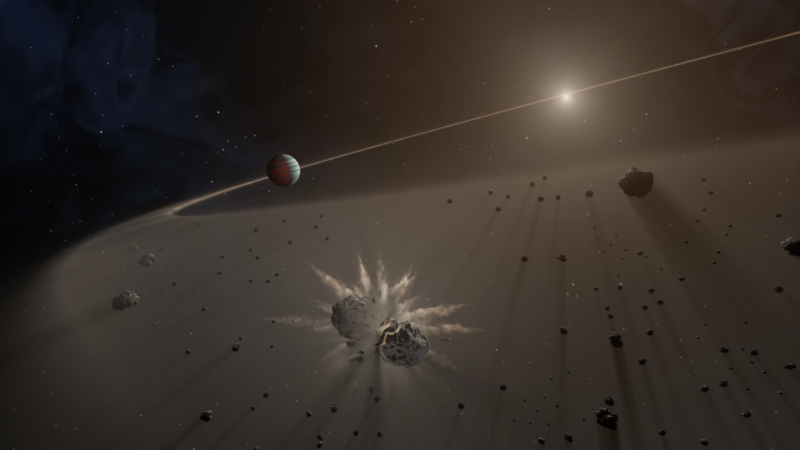 “It’s possible we don’t find small planets in these systems because, early on, these massive bodies destroyed the building blocks of rocky planets, sending them smashing into each other at high speeds instead of gently combining,” said co-author Dimitri Mawet, a Caltech associate professor of astronomy and a JPL senior research scientist. On the other hand, giant exoplanets are easier to detect than rocky planets, and it is possible that there are some in these systems that have not yet been found. Our own solar system is home to gas giants responsible for making “debris belts” — the asteroid belt between Mars and Jupiter, shaped by Jupiter, and the Kuiper Belt, shaped by Neptune. Many of the systems Meshkat and Mawet studied also have two belts, but they are also much younger than ours — up to 1 billion years old, compared to our system’s present age of 4.5 billion years. The youth of these systems partly explains why they contain much more dust — resulting from the collisions of small bodies — than ours does. One system discussed in the study is Beta Pictoris, which has been directly imaged from ground-based telescopes. This system has a debris disk, comets and one confirmed exoplanet. In fact, scientists predicted this planet’s existence well before it was confirmed, based on the presence and structure of the prominent disk. In a different scenario, the presence of two dust belts in a single debris disk suggests there are likely more planets in the system whose gravity maintains these belts, as is the case in the HR8799 system of four giant planets. The gravitational forces of giant planets nudge passing comets inward toward the star, which could mimic the period of our solar system’s history about 4 billion years ago known as the Late Heavy Bombardment. Scientists think that during that period, the migration of Jupiter, Saturn, Uranus and Neptune deflected dust and small bodies into the Kuiper and asteroid belts we see today. When the Sun was young, there would have been a lot more dust in our solar system as well. “By showing astronomers where future missions such as NASA’s James Webb Space Telescope have their best chance to find giant exoplanets, this research paves the way to future discoveries,” said Karl Stapelfeldt of JPL, chief scientist of NASA’s Exoplanet Exploration Program Office and study co-author.